Henan is a province of the People's Republic of China, located in the central part of the country. Henan is often referred to as Zhongyuan or Zhongzhou (中州) which literally means "central plain land" or "midland", although the name is also applied to the entirety of China proper. Henan is the birthplace of Chinese civilization with over 3,000 years of recorded history, and remained China's cultural, economical, and political center until approximately 1,000 years ago. Hubei is a province of the People's Republic of China, located in the Central China region. The name of the province means "north of the lake", referring to its position north of Dongting Lake. The provincial capital is Wuhan, a major transportation thoroughfare and the political, cultural, and economic hub of Central China. Nanyang is a prefecture-level city in the southwest of Henan province, China. The city with the largest administrative area in Henan, Nanyang borders Xinyang to the southeast, Zhumadian to the east, Pingdingshan to the northeast, Luoyang to the north, Sanmenxia to the northwest, the province of Shaanxi to the west, and the province of Hubei to the south. The Huai River, formerly romanized as the Hwai, is a major river in China. It is located about midway between the Yellow River and Yangtze, the two largest rivers in China, and like them runs from west to east. Historically draining directly into the Yellow Sea, floods have changed the course of the river such that it is now a major tributary of the Yangtze. The Huai is notoriously vulnerable to flooding. Jieyang is a prefecture-level city in Guangdong Province, People's Republic of China, part of the Chaoshan region whose people speak Teochew dialect distinct from neighbouring Yue speakers. It is historically important as the hometown of many overseas Chinese in Southeast Asia. It borders Shantou to the east, Chaozhou to the northeast, Meizhou to the north, Shanwei to the west, and looks out to the South China Sea to the south. Qinghe County is located in the south of Hebei province, China, bordering Shandong province to the east. It is the easternmost county-level division of the prefecture-level city of Xingtai. Biyang County is a county of Zhumadian city in southern Henan province, People's Republic of China. It borders Queshan to the east, Tongbai to the north, Tanghe to the west, Luohe to the north, Sheqi and Nanyang to the northwest. Population was 950,000 in 2002. Area is 2,682 km2 (1,036 sq mi). Tanghe County is administered by the prefecture-level city of Nanyang, in the southwest of Henan province, People's Republic of China, bordering Hubei province to the south. Its ancient name was Tangzhou (唐州). Tangzhou or Tang Prefecture (唐州), briefly known as Bizhou or Bi Prefecture (泌州) from 906 to the late 940s, was a zhou (prefecture) in imperial China seated in modern Tanghe County in Henan, China. It existed (intermittently) from 626 to 1380. Tongbaite is a rare mineral that has the chemical formula Cr3C2, or chromium carbide. Tiantai County is located in Taizhou, Zhejiang Province, People's Republic of China. 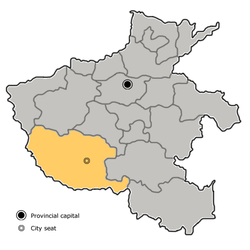 Tailai County is a county in the west of Heilongjiang province, People's Republic of China, bordering Inner Mongolia to the west and Jilin province to the south. It is the southernmost county-level division of the prefecture-level city of Qiqihar. Yishui County is a county of south-central Shandong province, People's Republic of China, located in the foothills region of the province. It is the northernmost county-level division of the prefecture-level city of Linyi. Huilong Township is a township of Tongbai County in southern Henan province, China, located near the trisection of the prefecture-level cities of Nanyang, Zhumadian, and Xinyang. It is situated 119 kilometres (74 mi) southeast of Nanyang, 48 km (30 mi) southwest of Zhumadian and 62 km (39 mi) northwest of Xinyang. As of 2011, it has 10 villages under its administration. The Tongbai Pumped Storage Power Station is a pumped-storage hydroelectric power station located 6 kilometres (3.7 mi) north of Tiantai city in Tiantai County of Zhejiang Province, China. Construction on the power station began in May 2000 and the first unit was commissioned in December 2005. The remaining three were operational by December 2006. The entire project cost US$904.10 million, of which US$320 million was provided by the World Bank. The power station operates by shifting water between an upper and lower reservoir to generate electricity. The lower reservoir was formed with the creation of the Tongbai Lower Dam on the Baizhang River. The Tongbai Upper Reservoir, which already existed before construction began, is in an adjacent valley above the east side of the lower reservoir on Tongbai Creek. During periods of low energy demand, such as at night, water is pumped from Tongbai Lower Reservoir up to the upper reservoir. When energy demand is high, the water is released back down to the lower reservoir but the pump turbines that pumped the water up now reverse mode and serve as generators to produce electricity. The process is repeated as necessary and the plant serves as a peaking power plant. The power station is operated by Shenergy Company. The 172nd Division was created in February 1949 under the Regulation of the Redesignations of All Organizations and Units of the Army, issued by Central Military Commission on November 1, 1948, basing on the 28th Brigade of Tongbai Military District. Its history could be traced to Independent Brigade of Jinan Military District formed in December 1945. The 173rd Division was created in February 1949 under the Regulation of the Redesignations of All Organizations and Units of the Army, issued by Central Military Commission on November 1, 1948, basing on the 3rd Sub-district of Tongbai Military District. Its history could be traced to 5th Independent Brigade of Jinan Military District formed in August 1947. Wuyigongyuan is a metro station of Zhengzhou Metro Line 1. The station lies beneath the crossing of Jianshe Road and Tongbai Road. The Nongye Expressway is a 12.9-kilometre (8.0 mi) long elevated expressway in Zhengzhou, Henan, China. ↑ "Profile of Tongbai County" (in Chinese). Xinhuanet . Retrieved 2008-06-25.